Radial piston machines are used in construction machines for crane rotation, for example. Radial piston engines generate very high torques at low speeds. 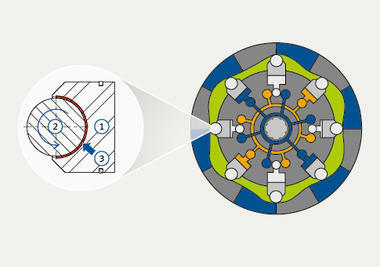 It's a straightforward principle: the pistons are moved radially by hydraulics. Rollers transfer the radial force to a cam track, thereby transforming it into a rotary motion. The rollers are supported in half-shells made from the KS PERMAGLIDE® P23 / P203 material. The sliding shells have a smooth surface and support the rollers in the piston base. They are subject to extremely high pressure while only mixed friction is present. The working fluid is hydraulic oil. P23 and P203 are special sliding materials offering high performance. They are designed for low-maintenance grease or liquid-lubricated applications. Materials P23 and P203 have smooth sliding surfaces and can also be used in hydrodynamic conditions. Materials P23 and P203 are available on request. Interested? Then submit a direct enquiry here!